Since turning 26 last month I have been reflecting on how my personal style has evolved with age. All my life people have told me I look young. When older men see the engagement ring on my finger many tell me that I am too young to get married. I get carded for lotto tickets (must be 18 to purchase), & people never look twice when I try to milk college discounts. I actually have the image of my 18 year old self in my head (anyone else? ), & wear clothes that I bought during my sophomore year of high school. As a graduate student I am trapped in this time continuum where no one ever seems to age. There never really was a major leap from college to where I am now, & I still have the luxury of wearing ratty t-shirts & jeans everyday if I choose to do so. Truth be told, I am that nutty person who dreams of having a job that would require me to don pencil skirts, silk blouses & pretty shoes. But without that current requirement I am stuck struggling to look put together & age appropriate all on my own volition. Do you dress for your age, your body or just what you like? What age do you see yourself as in your mind? I totally feel ya on the age thing! I am 29 and always get carded and questioned about my age. In recent years I have become more aware of my dress and shy away from things that make me look younger! I never get upset about the age thing though, because just think...when we are actually old we will still look much younger than everyone else! In my head I still feel about 24 but I'm 30. It's strange. I still feel like a kid who's still in college. I guess technically I should be 24 since I'm about to finish grad school. And enjoy looking young! Jess you look SO gorgeous. Classy and beautiful! Love that skirt. And your hair is looking extra super fab lately! I think you look gorgeous Jessica! Cynthia is so right, when you actually are older and looking young still, I'm sure you'll be jumping for joy. I love the way you belted that! If I could, I would wear cute pencil skirts and fancy clothes all day long, buttt I'm an undergraduate student so that's never going to happen. I'll keep dreaming though. Your makeup looks so fresh and pretty here–gorgeous! 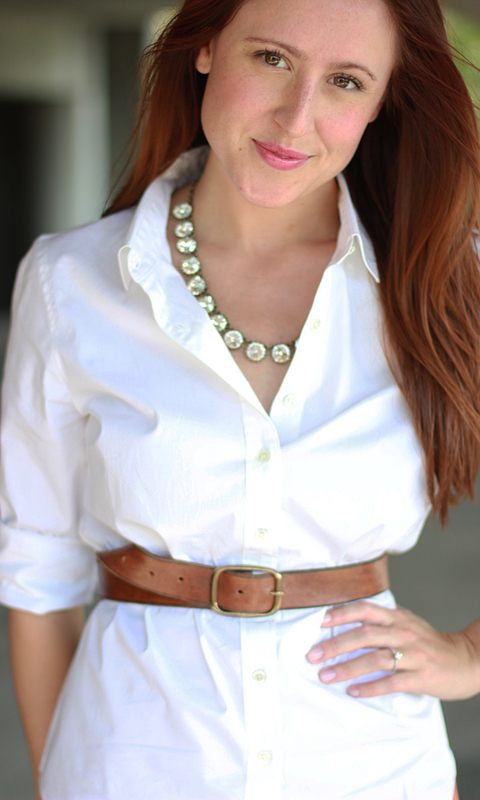 I love the fresh yet classic look of a belted white button-down! And this totally resonates- I can't wait to get a real job and get dressed up for work everyday! Casual is nice but sometimes I feel like my heels and dresses are wasting away!! These pictures are BEA-utiful Jessica! I'm 21 and everyone says I look 16. When I would ring up cigs & alcohol, customers and employees both would be "Are you even old enough??" "I'm 18, 19, 20" (whichever at the time). "No way! I thought you were 16!" Well, thanks. lol It's weird because apparently when I was younger, I looked older. But now I look younger. My father and I were just discussing it the other day. I said I had a Benjamin Button thing going. haha I love it though and I know it will be such a blessing as I get older. As far as dressing, I still own mostly clothes from high school, and I hate it. I'm that nutty person too. I dream of being a "heel lady". Even though I still struggle in my 5" heels sometimes, I love it. I love wearing skirts and dresses and pretty things. I actually hate jeans and would love to ditch all my tees. I would love, love, love a whole new wardrobe, but that costs! haha So I just acquire what I can and make do with what I have, and spend the majority of my time in pajamas. I definitely look younger than my age (27) and I hate being mistaken for college-aged or younger, especially at my job. I try to dress more mature and polished and always make sure that my hair and makeup is done. It definitely seems to help. I do have a job where I am required to dress in business attire, but I try to take my "mature dressing" into the weekends, too. 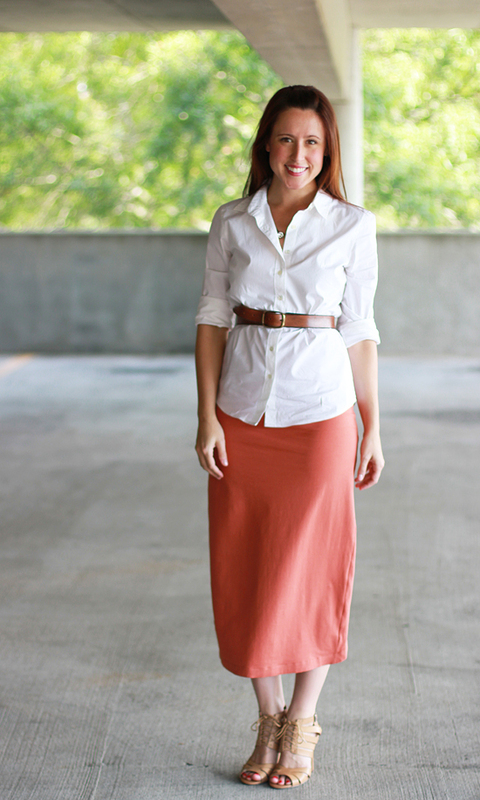 Longer skirts, no cleavage, polished accessories, etc. are my absolute musts! Also - could you look more stunning in that 2nd to last pic?? Gorge! I just graduated grad school and turned 25. I've been making a conscious effort to stop dressing like a teenager and start dressing more like a young adult. Now I try to make sure every piece I buy is still wearable in three or four years without looking like i'm trying to be young. When I started grad school a lot of people kept telling me, you're so young, you're still a baby (i was 22) so I made an effort to look the part of a serious grad student so I can be taken more seriously. 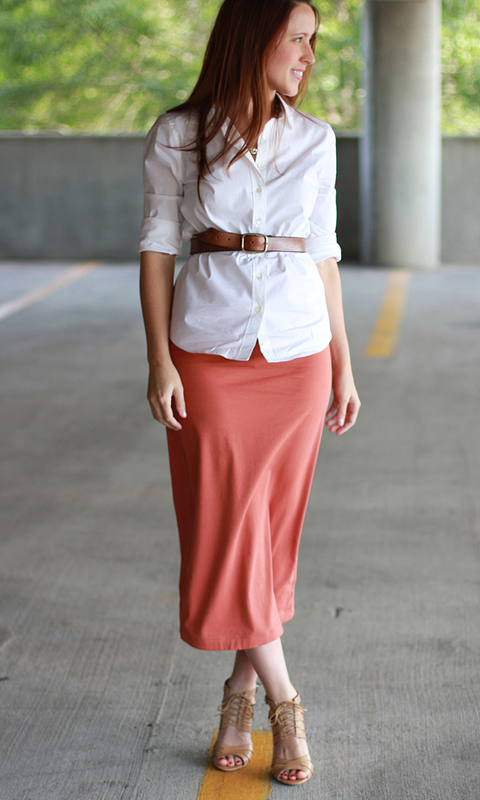 Love that skirt and necklace! Well I think you look fabulous here! I really like your hair pulled back like that. I have a hard time deciding what is appropriate for me sometimes too (I'm 32). I still love shopping at Forever 21 but have cut waaay back since my 17 year old stepdaughter started living with us & that's one of her favorite stores. When she started pulling things off the rack that I wanted to wear I knew it was high time to reevaluate my clothing choices :-) But now I feel completely outta the game with this pregnancy. I'm curious to see how my style evolves after the baby comes. But I'm determined not to put away my heels..EVER! haha I hear you on the trying to spin all the trouble I get for looking "young" now into thinking that I will certainly like it in a decade or two! I guess I just haven't looked in the mirror close enough to see those wrinkles that have popped up on my face over the years since 18! You certainly look fabulous my sweet friend! Thank you lady! I wonder when my inside age will catch up with my outside age! Thank you! You always look fabulous pretty lady! Exactly! I guess it is better than having to wear a uniform, creative freedom is good! Thank you Chelsea! I'm still going to be slathering on that night cream... just in case! You and me both lady! 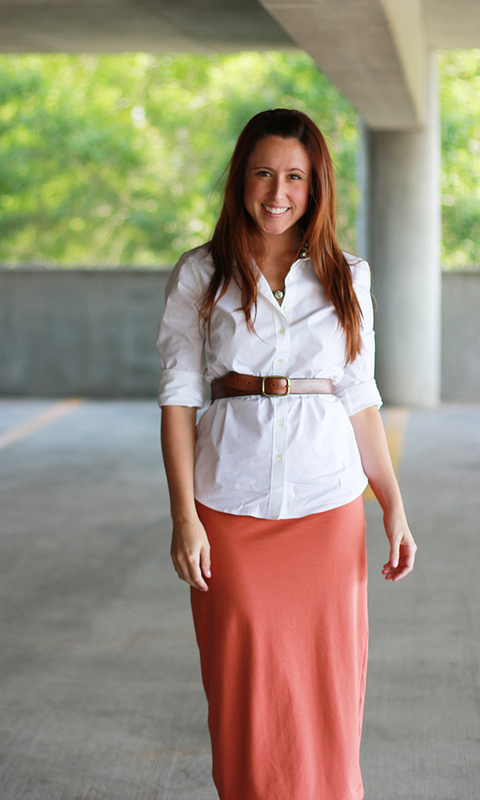 I just love the femininity of pencil skirts! Thank you! I have really been gravitating towards pink cheeks & lips lately! Thank you sweet lady! My heels definitely miss me when I am slumming around in my chucks all week! Thank you for your sweet words. I loved your comment about Benjamin Button! I think I have always just looked young. But I agree, building a "grown up" wardrobe takes time & I can't exactly just throw everything away until then... so bit, by bit I will continue to purchase only pieces I love, until my closet is filled with only that! Hair and make up is the part that I definitely struggle with looking age appropriate enough. You always look so polished! I have been meaning to go out and get myself a curling iron so I will actually fix my hair instead of throwing it up in a pony half way through the day! haha - a little bit of everything! If I ever have to wear a suit to work, I'm getting my first one at J.Crew! Now that would be FAB! Thank you, you are too sweet! Never put away the heels, you are going to be one fabulous mother! 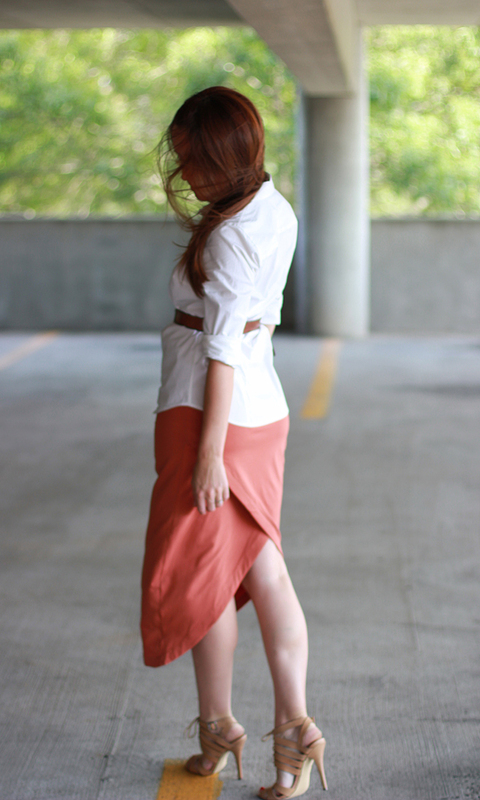 I love this skirt and it looks like you could maybe wear it both ways? Ha ha I still get carded sometimes and I am not even in my 20s anymore but you look great! I see myself perpetually 25. I'm a few years older and I too buy button down shirts and slacks also waiting for the day I can wear them to work. I'm in a style conundrum. I am loving log tunics these days my style is changing. I like loose fitting clothing these days after seeing one of my fashion idol's Parker Posey's laid back glamour, but then I see the younger generation' belts and layers and would love to pull those looks off too. At 45, 5"2' and shapely it seems to always be a challenge. I'm 30 and I struggle with this all the time. I look young for my age and I try so hard to dress like a grown up for work....but occasionally I slip up and wear something a bit too young....and then clients ask me to get them coffee and where their attorney is. Really nice post I can relate too! I'm an "older" blogger, turning 50 next year and I struggle with dressing for my age without looking dowdy or like I'm trying to look younger. I just buy what I like and looks good on the vertically challenged! You always look so pulled together with the best accessories! I totally dig this look! Fresh, crisp, professional, and chic! You always look great, Jessica! I tend to buy things people my age or younger would buy I think. I still shop at American Eagle, Hollister, and Aero at times but have been trying to step up my wardrobe a little while still taking advantage of the clothes I'm maybe expected to wear at 22. Take advantage of it while you can right? I am the worst person when it comes to judging how old I, or others, look. I always think I look young (I'm 28) until I see a 22 year old and then I'm like... nope I look old. I've started to become a little more self conscious about how I dress - like I should be dressing more mature or tailored than I do. I'm a total jeans and a tshirt (or nice, simple shirt) kind of girl - and sometimes I wonder if I'm supposed to grow out of that or not?! Age really is just a number though - you're right! I'm another older chick (48) that is caught in the middle of not dressing too young for my age but not wanting to dress like an old lady! Which I am not! LOL I like dressing for my size although I think I'm a bit of a modest person too.